Two generations of California-based photographers, including the legendary Ansel Adams, currently have their masterworks on display at the Autry Museum of the American West. Approximately 90 photographs from the Bank of America collection are being featured in an exhibit entitled “Revolutionary Vision: Group f/64 and Richard Misrach” until January 2017. “In this exhibit, you really have the arc of 20th-century photography as a medium,” said Amy Scott, the Autry’s chief curator. The first section of the gallery is dedicated to the work of Group f/64, which formed in 1932 to take a stand against pictoralism, a popular movement based on the idea that a photograph should resemble an impressionist painting. This style favored soft-focus images and hand-manipulated prints. On the contrary, Group f/64 wanted to highlight the camera’s unique ability to produce sharp contrasts and crisp graph- ics. For this reason, the group is named after the large-format camera aperture, which captures the maximum depth of field. The members, seven men and four women, also thought that producing un- altered images should be the new direc- tion of photography. Adams (1902-84) was among this group of Bay Area photographers, and his images appear alongside the work of fellow members Imogen Cunningham, Willard Van Dyke, Brett Weston and Edward Weston. 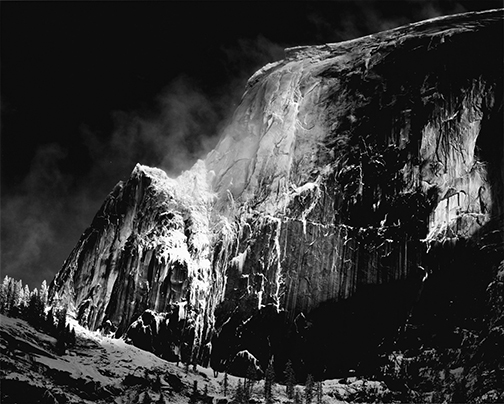 Some of Adams’ work displayed in the show include a grand landscape of snow blowing off Half Dome in Yosemite National Park and an intimate close-up of grass in the rain at Glacier Bay National Monument. “What I like about the Adams selection is that it runs the gamut of his work from this really romantic, sort of beautiful, take on Yosemite to his more modernist side as seen in the Glacier Bay photo,” Scott said. “Adams could walk on either side . . . he was a really versatile artist in that sense.” However, Edward Weston (1886-1958) could be considered the flagship artist for the group because his photographs contain such stark tonalities, which he couldn’t have accomplished without using the f/64 aperture, Scott said. “The brilliance of Weston’s work is really his ability to elevate the everyday into the extraordinary,” Scott said. In his compositions, Weston makes common objects look incredibly beautiful and often sensual. For example, his abstract close-up of a bell pepper (featured in the show) has the sensual curves of the human body. During his career, Weston focused on natural forms, nudes and landscapes. He was the first photographer to receive a Guggenheim fellowship, which he used to travel the West and create his best work. 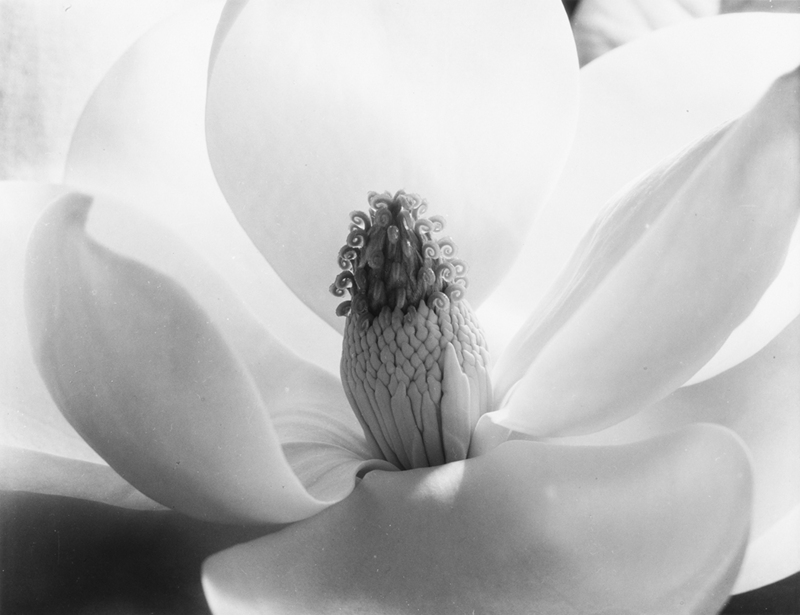 His son, Brett Weston, was also an ac- complished photographer, and his work is included in the show. Weston (1911-93) preferred to take close-up shots of his subjects and make them unrecognizable, so his photos possess an abstract quality. Cunningham (1883-1976) is known for her floral abstractions and portraits. She studied the chemistry behind photography at the University of Washington. After college, she received a grant to continue her studies in Dresden, Germany. She eventually moved to the Bay Area, where she joined Group f/64. Van Dyke (1906-86) is one of the lesser-known members of f/64 because he abandoned photography and moved into filmmaking in the late 1930s. He later became the first director of the film department at the Museum of Modern Art. “He focused on architectural subjects, but he also photographed humans, which is indicative of his interest in documentary film,” Scott said. For instance, his interest in social issues can be seen in his image of migrant workers during the Great Depression, which is in the exhibit. The second half of the gallery features the work of Misrach, a Bay Area photogra- pher who was born in 1949 and began his career in the 1970s. “Misrach was influenced by f/64 and was moved by their way to see natural beauty in the world, even the mundane or banal aspects of the natural world,” Scott explained. However, Misrach’s work focuses more on the damage humans have caused to the environment. He has dedicated his life to photographing the desert in a series he calls Desert Cantos. In that work, Misrach comments on the effects of environmental overuse, including tourism, industry and even war, but he does so in a way that captures the aesthetic beauty in those damaged environments, Scott said. To help museumgoers visualize how f/64 informed Misrach’s work, Scott se- lected some of his images and set them di- rectly alongside f/64 photographs in the center of the gallery. She shows, for exam- ple, how Misrach uses the same asymme- try and compositional arcs in his image of the Salton Sea as Brett Weston does for his photograph of San Francisco Bay. The curator also placed some of Mis- rach’s early work next to Cunningham’s on the same wall because of their similarities. “He adopts some of her stylistic approaches such as isolating a plant, and photographing it head on so that it calls attention to its detail,” said Scott, who noted that the show is a unique opportunity to see f/64’s and Misrach’s work side by side. To view these masterworks, visit the mu- seum, located at 4700 Western Heritage Way, between 10 a.m. to 4 p.m. Tuesday- Friday and 10 a.m. to 5 p.m. Saturday and Sunday. It costs $10 for adults, $6 for students and seniors over 60, and $4 for children ages 3-12. Free for Autry members and children under two. Admission is also free on the second Tuesday of every month. Information: theautry.org.